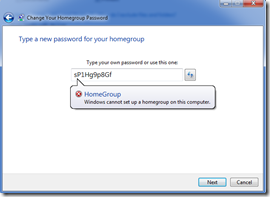 One of the most useful and user friendly features of Windows 7 is the HomeGroup feature. HomeGroup takes the burden out of sharing files and printers on a home network. You have the ability to quickly and easily connect two or more PCs running Windows 7, while automatically sharing your music, picture, video, and document libraries with other people in your home. I have had my wife’s notebook connected via HomeGroup to our main PC for a while, so when I finally got my notebook I was hoping to be able to do the same thing. 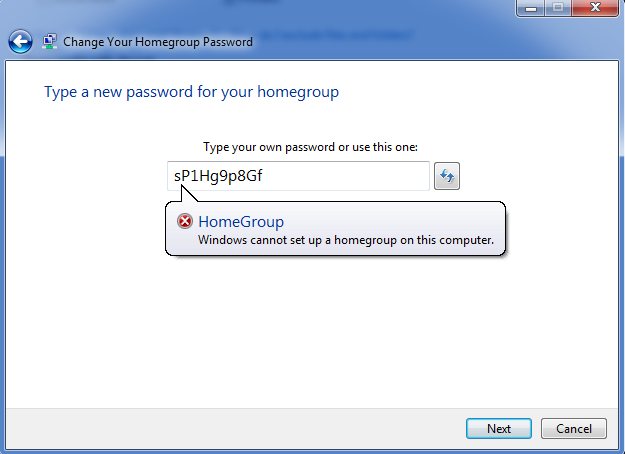 Unfortunately when I tried to connect to the HomeGroup with the supplied password it failed, I immediately assumed that the password was incorrect and went to the main PC to change the HomeGroup password and it resulted in the error “Windows cannot set up a homegroup on this computer”. After digging around I noticed that Event Viewer had been throwing an error for a while related to the Peer Name resolution, specifically: “The Peer Name Resolution Protocol cloud did not start because the creation of the default identity failed with error code: 0x30630801”. After reviewing the services “Peer Networking Group” was stopped which itself is a service that … “Enables multi-party communication using Peer-to-Peer Grouping. If disabled, some applications, such as HomeGroup, may not function.” Aha! Unfortunately any attempts to start this service resulted in another error message “Windows could not start the Peer Name Resolution Protocol service Local Computer. Error 0x80630801: 0x8063080”… aaaaaaahhhhhhhh! First ensure that you have “Show hidden files, folders and drives” folder option enabled. Open the following folder as an administrator: “C:\Windows\ServiceProfiles\LocalService\AppData\Roaming\PeerNetworking”. Delete all the contents and restart your PC. Delete the existing HomeGroup (if you have one). You should be able to successfully create a new HomeGroup! Please note, there is no implied warranty for on any solution I provide on this blog … ever. This worked for me on my PC, and I could not find an official solution. If you try this and your PC starts doing crazy things I will not be held responsible in any way shape or form and I am not likely to spend too much time offering help or resolution outside the general comments I provide on this blog.